I haven’t done bird posts prior to now, but I do plan to salt them in among the tools posts. Hope the readers enjoy. I’ve seen Purple Gallinules (Porphyrio martinicus) before, down in the Everglades, but that was prior to me becoming a birder and keeping a life list. Since I became a birder in 2003, I’ve never run across them, so the species wasn’t on my ‘official’ life list. Honestly, I never really chased them, which is most of the reason why. 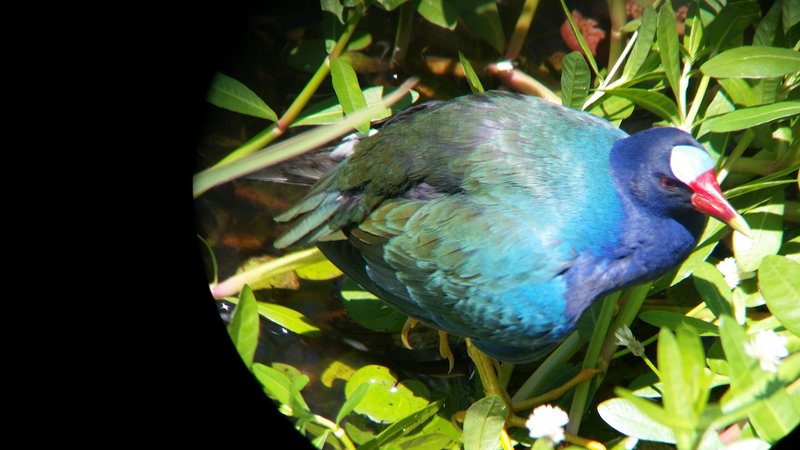 Purple Gallinules are a very attractive species of swamp-hen, part of the rail family. Fast forward to early May, 2017. 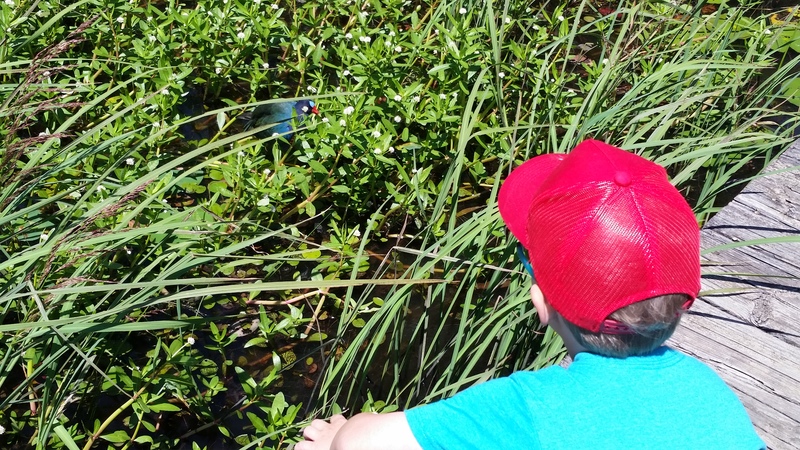 With a new baby in the house, my #1 kid was in need of some outdoors time. 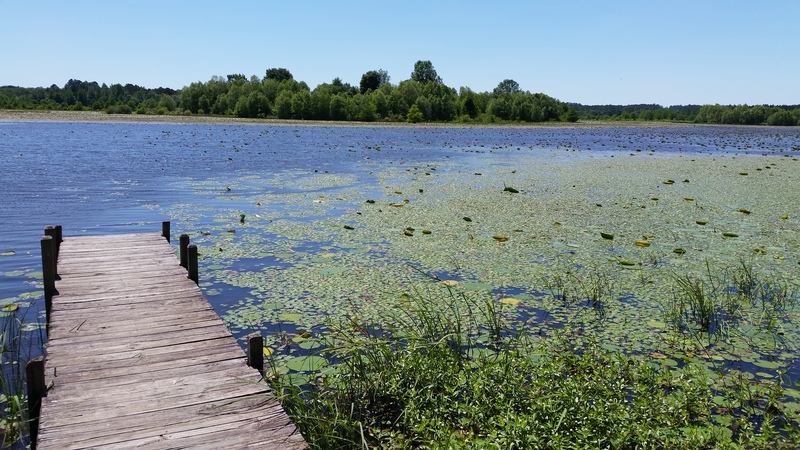 I’d seen some posts at the Friends of Noxubee National Wildlife Refuge facebook page of some Gallinules that were hanging around Loakfoma Lake, so I threw #1, #2, and grandma into the 4runner and drove us down to see if we could find one. It was a nice day, not cool, but breezy. I had my doubts about finding a bird with the wind. 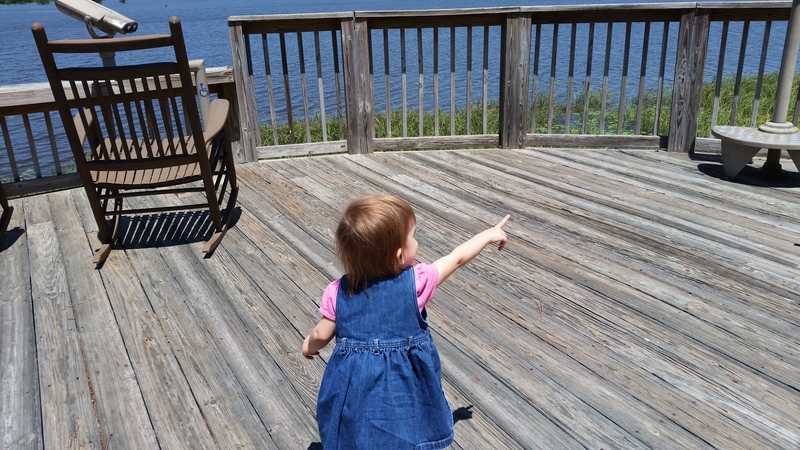 We started at the visitor center deck just to let the kids get some air and use the facilities. #2 thought she might see one. 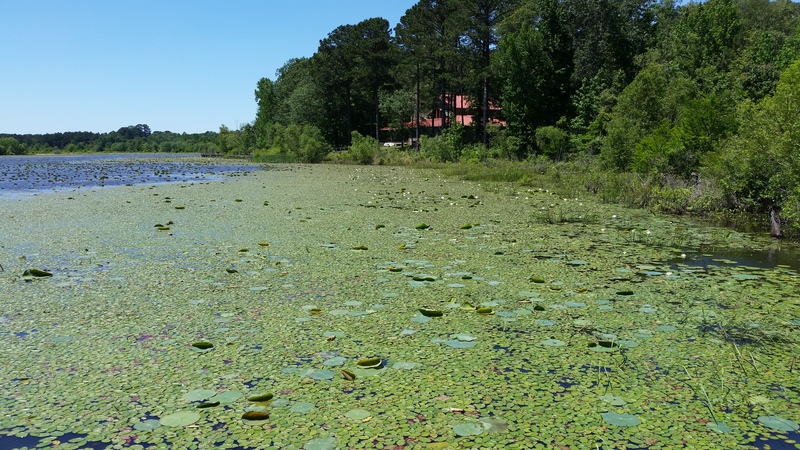 The Refuge staff told us at the visitor center that there had been some Gallinules hanging out at the overlook on Lake Loakfoma, so we headed down to the overlook, a sort of treehouse / gazebo with a South-facing view of the waterlily-covered, shallow lake. Unfortunately, we got skunked at the overlook. 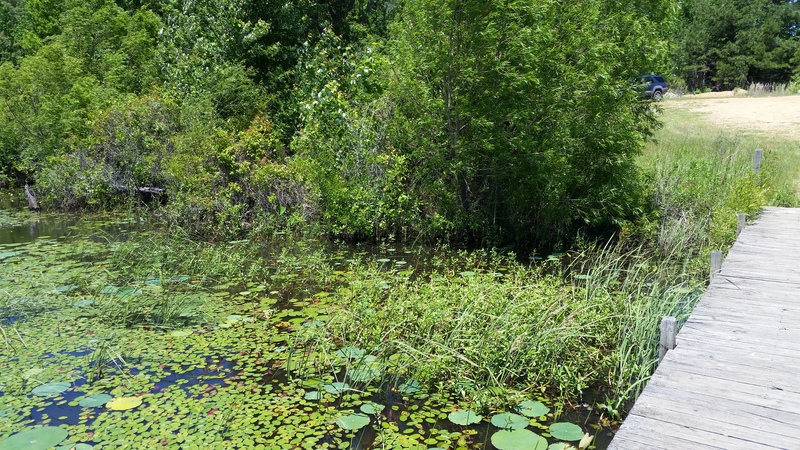 Next, we headed down to the boat ramp and little dock on Loakfoma Lake, about halfway down the east side of the lake. We got there and the wind was worse, but we had a look around. Boat dock on Loakfoma Lake. 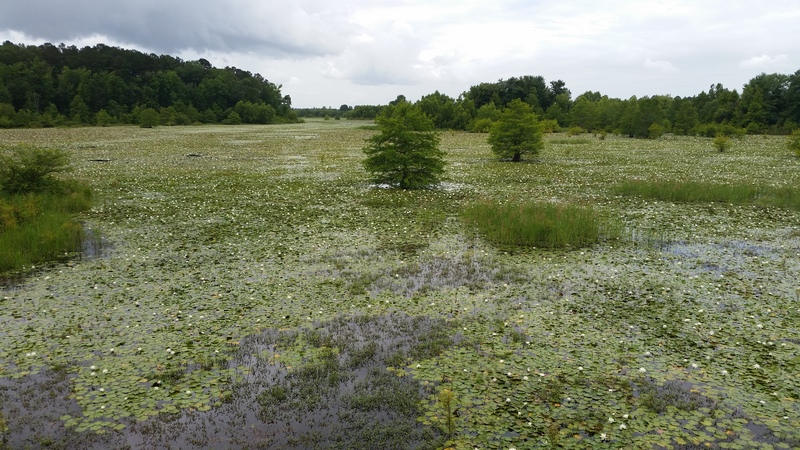 Shoreline vegetation at Loakfoma Lake. …And stopped in my tracks. Literally two feet from #1 and me. 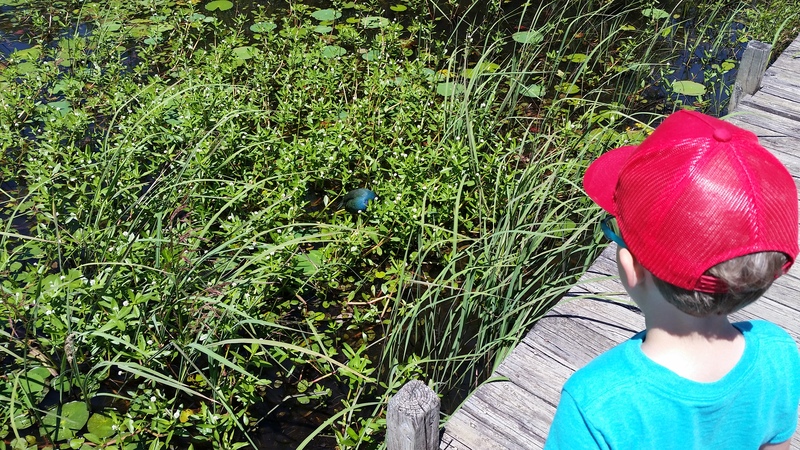 There was our Gallinule, inexplicably ignoring my jumping-happy son and I on the dock. I cannot believe it didn’t flush, but it just sat there hanging out, looking at us. I can’t stress how close we were to this bird. I could have reached out and grabbed it. I wish I was better set up for taking photos. All I had available was my phone. I’d love to be set up to do digiscoping. I tried holding my phone up to my binoculars and got some semi-decent results. 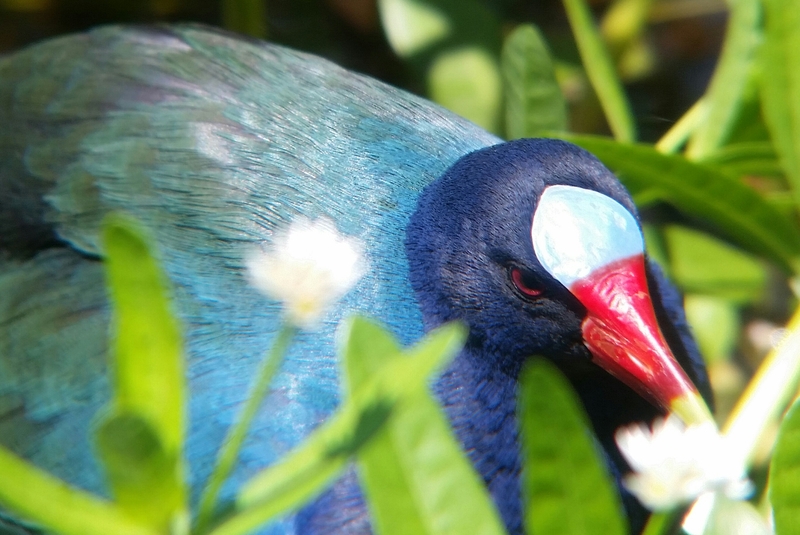 I tried some digiscoping with my phone and my binoculars, which turned out … eh … ok. 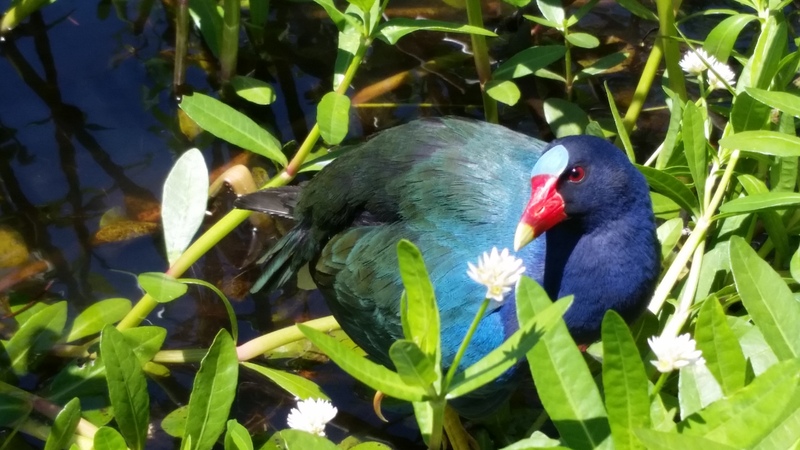 The colors on the Gallinule were beautiful. It was unbelievable how close we were to this bird. Best shot of the day. We sat on the dock for a good ten minutes and watched this guy just look around and peck at bits of stuff in the water. Finally, it slowly made its way off to look for more lunch. 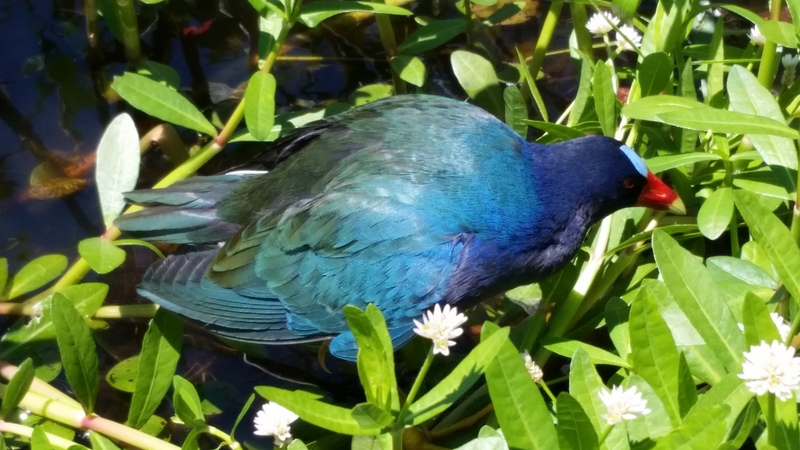 Here’s a somewhat shaky video of my Gallinule. So that was my lifer Purple Gallinule (Life list bird #225). My list should probably be much larger, but I don’t get to go birding like I used to between work and kids these days. 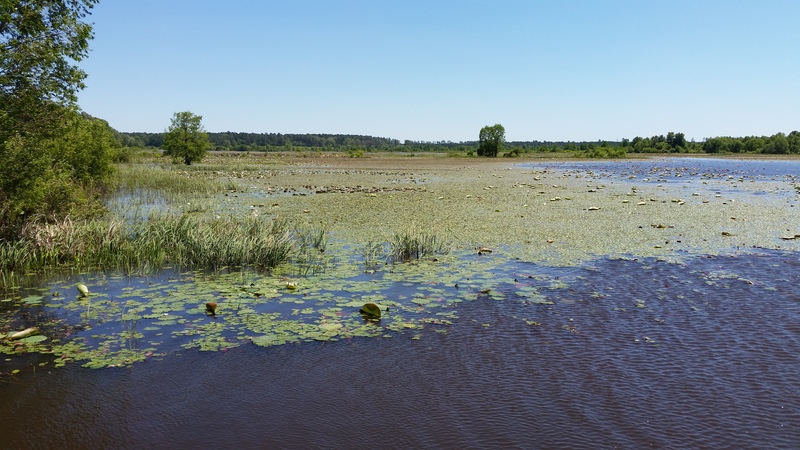 Finally, you can’t go to Noxubee without an obligatory alligator shot. Annoyingly, this is where my $25 duck stamp blew out of the car and disappeared. It’s too close to July 1 to bother buying a new one until then. 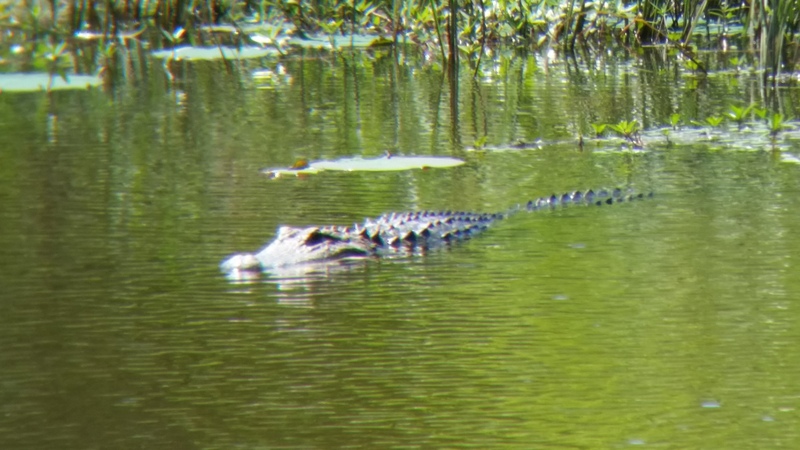 Distant American alligator (Alligator mississippiensis) at Noxubee. Hey, Michael. I enjoyed this post. 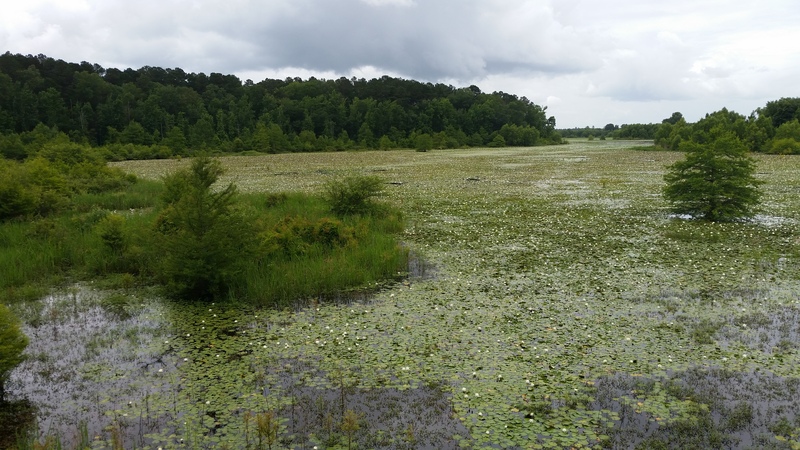 You should come out with the Oktibbeha Audubon Society for our monthly bird walks at Noxubee and surrounding areas. You seem to like the same things that most of us enjoy. Anyway, if interested, consider joining our Oktibbeha Audubon Society FB page, which is where we advertise our outings. We would love to have other bird enthusiasts join us. Thanks for coming by my page. I will admit to viewing your eBird reports with envy! I’ll definitely join the OAS facebook page. I’ve been meaning for years to check the group out. I usually bird alone for the ‘me time,’ but it might be fun to go with a group. I’ve been so occupied with grad school and our little kids at home that my birding has suffered for several *cough*five*cough* years, but since December, I’ve been pretty serious about getting out regularly (shh…don’t tell my wife! lol). I’m doing a personal Mississippi “big year” in 2018. It’s not going to be impressive compared to other people’s big years (particularly one of your regular years! ), especially since I doubt I’ll be able to travel very much. However, so far I’ve gotten my MS list up to 72 species this year so far (with a number of common birds I’ve yet to pick up for various reasons, mostly time). So, it may end up being a decent endeavor. I’ve also made it a goal to bump my life list from 225 to 250 this year. So far, I’ve added 7 species this year. That’ll be hard for me to accomplish unless I do well during migration and possibly get in a trip to the coast. I’m also starting to get involved on eBird, which I’ve sort of ignored until this winter. I’ve got 4 years of intensive field survey data from my MS and PhD projects that I’d like to eventually add, but there are issues with permissions that have prevented me from putting the data in thus far.